Let me first say that I am not a forum wizard by any means, and I apologize if I mess up any posting protocols while attempting to share and update this thread. I have been tinkering with an add-on VCO circuit for the 3TrinsRGB+1c video synth. The VCO circuit is built around the cd4046 ic and gets up into the MHz frequencies. Importantly, it is hard-syncable to Hsync and Vsync signals from the 3Trins (I have opted to use an LM1881 to strip the sync signals from 3Trins video, even tho the signals can be tapped internally). I made 3x of these for myself on some protoboard, and they are very fun for extending the 3Trins. After realizing there was some interest on the 3Trins FB forum, I am planning to try to make some PCBs. This would be my first attempt at doing something like this. Currently, the plan is for a board that supports 3x VCO's and the LM1881 – all powered from the 3Trins headerbay. The LM1881 would have 6 headers (3x for Hsync and 3x for Vsync)... Each VCO would have dedicated headers for sync input, CV input, and VCO output. I am trying to gage interest from folks here regarding such a "module". If I can get my act together to make a viable "plug-on" PCB... are any of you tentatively interested? I'll post some video links soon to entice, and I will update with any progress. I'd be interested. It's a great little synth. question: does this really work on the power from the patchbay? Works on mine. I'll make a video tonight and post to show. I will also measure my header output for comparison. If I make these, I could send you one to try first, too. It also will 'sync' to other sources (like lfos or RGB outs) without the LM1881, but then it partly defeats the purpose. For those interested, the circuit is quite simple. The CD4046 ic has a built-in VCO (that reaches up into MHz frequencies) and was designed as a PLL with two different types of phase comparators. One of the phase comparators acts effectively as an XOR gate. 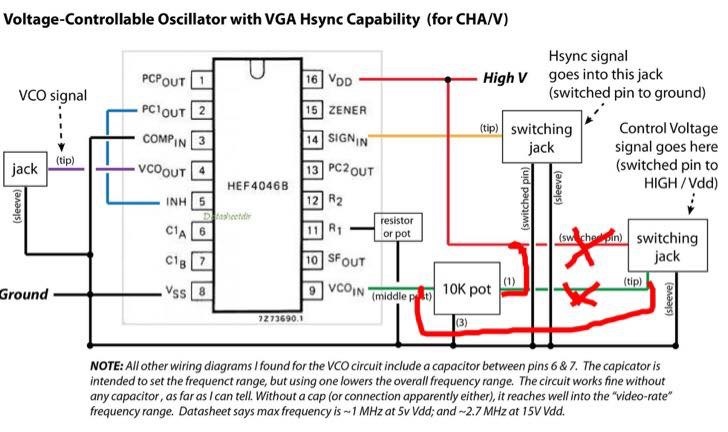 The ic also has an "inhibit" pin that stops the VCO, and when the VCO starts again its phase is reset... so the VCO can be easily hard-syncd by chaining these features. This is critical for video VCO, so that the signal canock to line and frame tracing sync signals, allowing it to generate stable lines/patterns. The fact that it can be controlled by CV outta-the-box makes it great! Me too! Eurorack config/panel too!?!?! Here is a link to a video example of 1x 4046 VCO with the 3TRINS. I have made a breakout for the 3Trins header bay, and I am using that for patching. Power is coming from the breakout-bay (so from 3Trins headers) goes to the breadboards that have the 4046 and LM1881 (and an inverter) on them. I didn't have time to plug in all three at once tonight, and I figured this was at least good for showing that sync works from the LM1881 powered off headerbay. I will post more videos soon on less busy nights. A couple more video links here. These show using an 8-step sequencer and 1x 4046-VCO (sent to Red channel on 3Trins). It is fun when the sequencer is clocked at audio rates. One video is just noodling with the sequencer, and even 'syncing' the sequence crudely with the Vsync sent to the RESET on sequencer. The other video is the sequencer and a digital oscillator mixed together. The oscillator is the Pittsburgh Modular DNA symbiotic waves ('MIX' output)... makes fun patterns and has fine-tune so can sorta dial in some fun stuff. There is some horizontal noise (most obvious at very beginning) in the second video that seems to be related to the DNA's signal going through the CV mixer. I just tested the 4046 on 3trins power, that works fine . I couldn't get the 1881 to sync the signal though, maybe i'm doing it wrong. do you use the sync output/input (RSin) from the 3trins or the Rout to get the sync to the 1881? and pin7 from the 1881 directly to pin14 of the 4046? I use the actual composite video from 3Trins, the onboard sync signals (Rsin, etc) never worked for me either. As for the wiring... Pin14 on 4046 gets wired to whatever sync you are using... so if want Hsync from LM1881, that is pin 1 "composite sync". If going straight from LM1881, then pin3 on 4046 needs to be held high. I had these wires up originally for VGA sync which is opposite polarity (and I have pin 3 on 4046 grounded), so I am using an inverter 4069 to invert the sync. This is how I soldered them up to use with a VGA synth I was making. For this to work with 3Trins, you either want the opposite polarity in wiring of pins 3 and 14... or you want to invert the composite sync signal (which is what I am doing for now because they are all soldered up already). In next week, I am going to breadboard the whole "module" I am planning, and I will try to document it here and show how goes. I am probably going to change the circuit slightly, but this cartoony schematic might get you up and running to play around. Love anything that expands on the fantastic 3trins! feel free to PM me if / when something is ready to go. i will see the message even if i don't see the new posts here.